Street art has quickly become a cultural global sensation. Internet giants like Google have categorized street art works worldwide, while a handful of cities have risen into the global consciousness by boasting of their entire districts dedicated to street art murals. Yet, street art remains controversial, and the rights artists have over their works continues to be a messy subject. Here, we’ll discuss why the Visual Rights Artists Act doesn’t always apply to street art, and why some still consider the movement illegal. In 1974, Norman Mailer wrote, The Faith of Graffiti, one of the first literary works that looked at the origins and importance of graffiti in modern urban culture. Mailer’s belief was not widespread with many opponents looking at graffiti as no more than vandalism. The battle between those two camps have waged ever since, although the graffiti artists, (now given the more politically correct name of street artist), have slowly begun to win the battle. The term ‘street artist’ has also evolved and come to be applied to this work because it is often far more detailed and artistic than your average graffiti scribble. 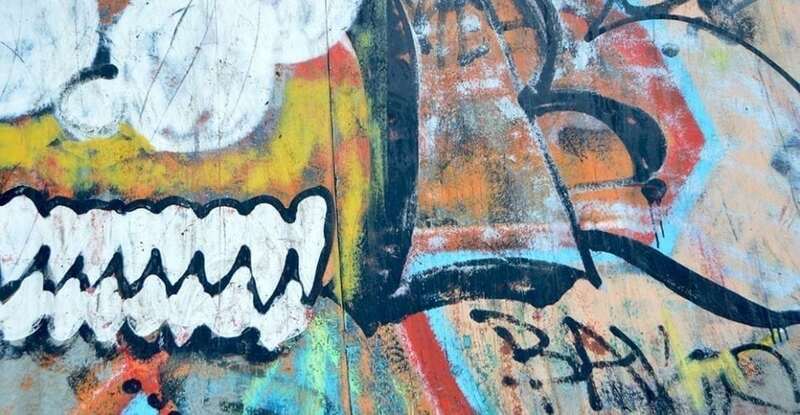 Where on might associate graffiti with a spray-painted tag or moniker, street art is often far more in-depth. Most use their work to make social or political commentary, often drawing figures or murals with anti-establishment messaging. Artists like Banksy and Mr. Brainwash have actually made the public salivate with anticipation as they await their next creative exploits. While often unsanctioned, street art allows the artist to bypass the confines of the formal art world where only the elite can participate. Communicating directly with the public allows street artists to present socially relevant content while at the same time beautifying the bleak sprawl of urban decay. Still, many critics argue that street art is an act of vandalism, centered on the fact that most street artists don’t seek permission from owners of property before scrawling their work onto walls. On the one hand, street art is often an aesthetic enhancement and adds to a neighborhood’s local flavor. On the other hand, many street artists don’t have the authorization to create the piece, which therefore renders it vandalism. Whether graffiti is art or crime has an implication in protecting the integrity of a street artist’s work. If considered art, these creative works would likely be shielded under the Visual Arts Right Act (VARA). VARA protects the work of visual artists from intentional distortion, mutilation or other modification. Under VARA, works of art that meet certain requirements afford their authors additional rights in the works, regardless of any subsequent physical ownership of the work itself, or regardless of who holds the copyright to the work. For instance, a painter may insist on proper attribution of his painting, and in some instances may sue the owner of the physical painting for destroying the painting even if the owner of the painting lawfully owned it. right to prevent any destruction of a work of recognized stature, and any intentional or grossly negligent destruction of that work is a violation of that right. In other words, VARA is, in fact, designed to protect art from being altered, and many artists across the country have claimed their VARA rights were violated when their street art has been painted over or otherwise covered up. Despite such broad definitions, VARA has a narrow reach, and courts have been somewhat divided on whether VARA can be claimed by street artists seeking to recover damages for their covered-up work. Many street artists who have attempted to claim that their VARA rights were violated have been met with resistance from courts who have clung to the requirement that the work be of ‘recognized stature’ in order to prevent destruction. For example, 5Pointz, an outdoor art exhibit space in Long Island City, New York, considered to be the world’s premiere “graffiti Mecca,” was denied VARA protection based on this requirement. Since 1993, with the property owner’s permission, artists have been creating unique artistic works on numerous walls of a 200,000-square-foot factory. 5pointz has now become a tourist attraction, with hundreds visiting each week. Now, the building is supposed to be razed to make way for a luxury apartment complex. Sixteen artists sued to preserve the space citing VARA, but a New York judge ultimately ruled against them, claiming that he’s not yet sure “that street art can be considered art,” and is therefore not of a recognized enough stature to be afforded this protection. On the other hand, a seminal case in California set a very different precedent. When artist Ken Twitchell’s mural of artist Ed Ruscha was whitewashed without Twitchell’s consent or knowledge, he sued for damages. A court awarded Twitchell over $1 million in an unprecedented ruling which many claimed was VARA’s greatest victory of the time. Whether or not street art is ‘legal’ remains an issue when legitimizing street art. Some are taking steps to address that issue. Los Angeles, often on the forefront of intellectual property issues, recently passed a new murals ordinance making street art legal if you pay for a permit, get permission from the location, and publicly post your intentions. Shepard Fairey, best known for his Obama Hope poster and his Obey campaign, has teamed up with renowned graffiti artist, Risk to create a major piece in Skid Row. Another work will be painted in the Arts District by culture-jamming contemporary artist, Ron English. Other artists, however, continue to thrive on the illegality of their work. Banksy is one such example. Often engaged in very public projects – such as a New York City endeavor in which he created 17 works throughout various neighborhoods – Banksy is often pursued by law enforcement. 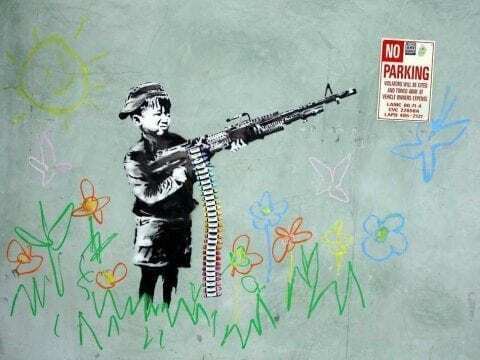 Despite the aesthetic value of Banksy’s work, Banksy is often viewed as a vandal and a menace, and the vandal squad of the NYPD has reportedly spent hours of surveillance footage looking for clues to Banksy’s whereabouts. Mayor Bloomberg has said that any Banksy works on public property will be removed, and has kept his word. Meanwhile, the public seems to have a different view with several places hiring guards to protect Banksy art while others have removed the murals intact, making them available for sale. Banksy murals have sold for millions of dollars, and they’re often lifted off walls and sold to the highest bidder. Banksy, unlike most of his counterparts, is an incredibly wealthy man: his net worth is estimated at $20 million. So, while the battle rages on, it at least seems for the time being that street art is gaining public support and it may only be a matter of time before laws and judges follow suit on declaring street art a recognizable, legitimate and perfectly legal form of expression. If the graffiti work is not signed, and the artist is unknown, would that artist not have to prove beyond reasonable doubt that they are in fact the owner of the copyright, and would that not be a very difficult thing to prove? Then once that have proved copyright ownership (assuming they are successful) would they then be liable to prosecution for vandalism by the property owner? So with this story in mind where does the law land on use of in=mages to earn income. For instance: I take a photo of an illegally posted street art sticker, then make a drink coaster and sell it on Etsy. Does the artist in this case have any legal right to earnings from the sale? You own the copyright in the photo being used to create the item, however, the art itself is the intellectual property of the artist. You made a derivative of their work without their permission, so yes, they are entitled to earnings from this sale.